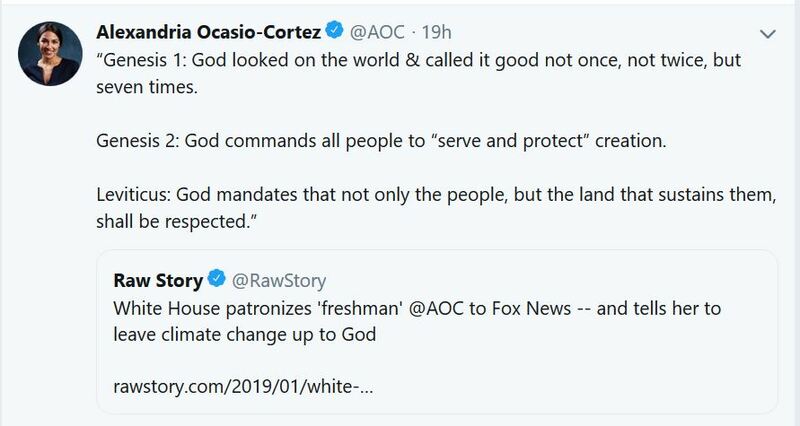 Rep. Alexandria Ocasio-Cortez (D.-N.Y.) sent out a Tweet on Wednesday responding to criticism of her views on climate change by quoting from the Bible. “Genesis 2: God commands all people to ‘serve and protect’ creation. Ocasio-Cortez did not indicate which translation of the Bible she was using or provide links to the passages she cited. In Genesis 1: 27-29, after God created the things of the world and said they were "good," He made "man in his own image," as “male and female,” told them to “replenish the Earth and subdue it” and gave them “dominion” over other creatures.